Since I’m going to begin sharing our book club discussions with you, here’s a complete summary from this past year’s reading. Silver Oak (5): Irresistibly hard to put down – so good, it may hinder you from other activities. Boutique Special (4): Will visit this vineyard again; worthy of sharing with friends. House Wine (3): Fine for daily use, but there is definitely better out there. Two Buck Chuck (2): Last bottle on the shelf; it takes some effort to drink and may be difficult to finish. 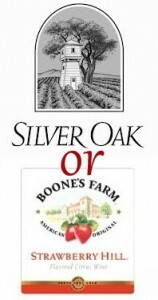 Boone’s Farm (1): Pour out the bottle – it has turned to vinegar!